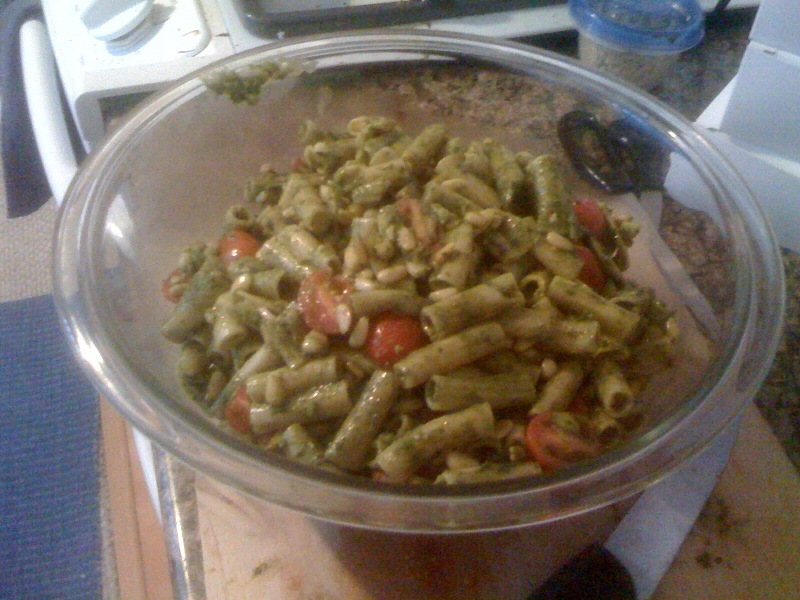 OK so maybe I was kidding about the third one, but I did go on a picnic and I did make a pesto pasta salad. Last Sunday I went on the most gorgeous hiking trip with my new friends in the Greater LA Veggie Hikers group. We drove out to the California poppy fields and then did an amazing hike of Devil’s Chair. Not only was the scenery lovely, but the change in elevation really got my blood pumping. Yes, we saw lots of great bits of nature, but the best part of the entire day had to have been the vegetarian potluck. There were so many delicious vegan dishes, and it was the first time in months that I can remember having so many different options on a table. I ate a ton of different pastas and salads and some great dessert. It sure was a good thing that we were able to burn it all off in the afternoon. For my contribution to the event, I brought a pesto pasta salad with brown rice pasta. It was pretty good, but definitely not the most delicious thing on the table. This is a dish that is great hot but is also good cold. It’s a great take-along dish for any potluck or picnic, or sometimes just to keep in the fridge when you know there are going to be nights when you don’t even have time to heat up dinner. Bring a pot of salted water to boil and add the pasta. While it cooks, assemble your pesto. Place washed basil leaves, garlic, olive oil, vegetable broth, and nutritional yeast in a food processor and pulse until smooth. Cut the grape tomatoes in half, don’t worry about removing the seeds. When is is cooked, drain the pasta and toss with the pesto and tomatoes. Sprinkle with pine nuts and serve hot, cold, or anywhere in between.